I am VERY excited about the upcoming school year here at Foxcroft Academy. There is SO much to tell you all about! Joining us this year will be Kaitlin David as the FA Choir co-director and beginner piano instructor. 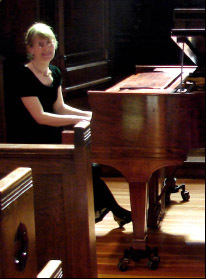 We also have a new artist, Margery Aumann, joining us this year who is available to give advanced piano instruction. Lastly, I am very excited that Mr. Poland, who gave 28 years of dedicated service to this very school, will be returning this year. He is going to be available for private instruction during periods 3, 4, and 5. Lessons will be given during study halls will only cost students $6 (an amazing bargain for lessons with such a great teacher). He will be teaching all instruments and voice. There is a lot more to share with you, but I will do that in later correspondence. Be sure to sign up for the blog (at the right) if you have not done so already. Thanks for being part of the Foxcroft Academy Music Program!